Spaniel Dixie was enlisted to check for illegal tobacco sales at the auction centre in New Elgin. 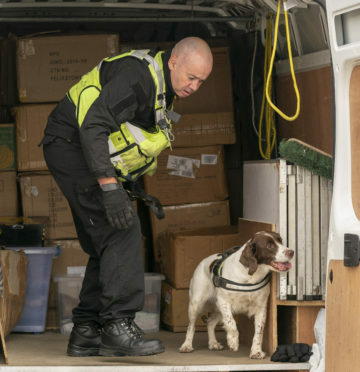 Spaniels Dixie and Daisy and their handler Bobby Cranie were enlisted by the region’s trading standards team to detect the smell of cigarettes. The trio were at the market held at the auction centre in New Elgin on Saturday to perform spot checks on the traders there to ensure no illicit products were being sold. The eager dogs were sent to work in the morning and sniffed cardboard boxes that had been taken to the sale in vans before being turning their attention to the stalls inside. Trading in counterfeit tobacco has been linked to organised crime and other gang-related offences. A spokesman for Moray Council’s trading standard’s team explained the cute pooches are “invaluable” tools to rooting out illegal sales due to their sense of smell being 50-times stronger than humans. He said: “The sale of tobacco is highly regulated and businesses have to register to sell it legally. “The sale of counterfeit products increases health risks to the public, undermines government policy to curb smoking and harms the legitimate interests of brands. A Facebook trader in Moray was fined £600 in 2015 for selling fake cigarettes using social media. Since 2011, four unregistered sellers have been issued with fixed penalty notices for not having the proper registration. David Bremner, chairman of the council’s planning and regulatory services committee, was encouraged to hear the operation was being carried out.